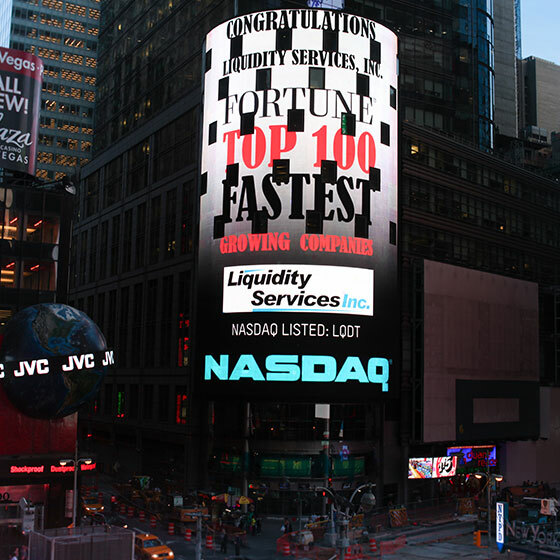 Liquidity Services was founded on a set of Core Values and the belief that there is a better way forward in the $150 billion reverse supply chain industry – a way to transform surplus from a burden into a value-added opportunity. After more than a decade of domestic growth, Liquidity Services expanded its international presence when it acquired GoIndustry DoveBid, a leading online marketplace for surplus commercial assets. Expanding into several new industries, Liquidity Services provided a streamlined solution to companies, regardless of the asset category or where they were located in the world. The company enhanced its growing record of market data on assets – from lab equipment for the biopharmaceutical sector and assembly equipment for the automotive industry, to big rigs for the trucking industry. By 2017, the company surpassed $7 billion in total sales and had been named to Forbes Magazine List of Best Small-Cap Companies in America six times, The Washington Post Top 200 Companies seven times, as well as receiving multiple additional awards for its innovation, client success, growth, and sustainability efforts. The company also has over three million registered buyers from across the globe that leverage its marketplaces to find and buy assets and merchandise for their businesses. The company has also successfully launched its integrated e-commerce platform, LiquidityOne, which integrates its multiple marketplaces and backend systems to increase efficiency for the company, its sellers, and its buyers. In July 2018, Liquidity Services acquired Machinio, a leading global platform for used equipment listings, to expand the portfolio of solutions the company offers its base of commercial and government customers to monetize assets. 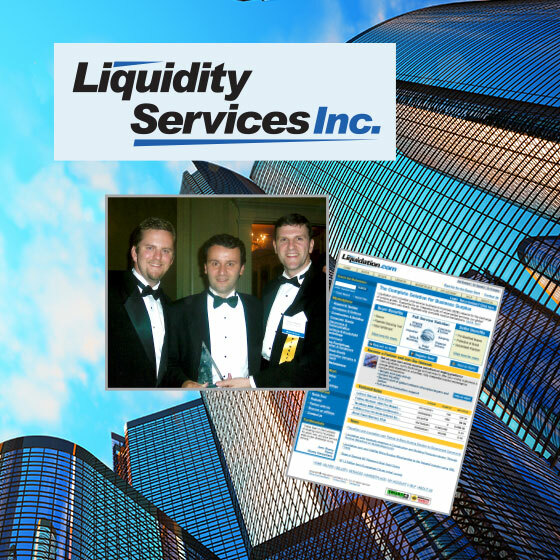 In 2005, Liquidity Services expanded its warehouse footprint and opened its first retail distribution center in Cranbury, NJ followed by an additional warehouse in Garland, TX. Through a growing footprint and talented warehouse management, Liquidity Services successfully demonstrated its ability to manage a high volume of inventory, delivering value through the sale of surplus in secondary markets. Also in 2005, the company won the Scrap Venture contract from the United State Department of Defense and the Defense Logistics Agency (DLA), further solidifying its role as an award-winning supplier for surplus that required a high level of scrutiny before passing to market. 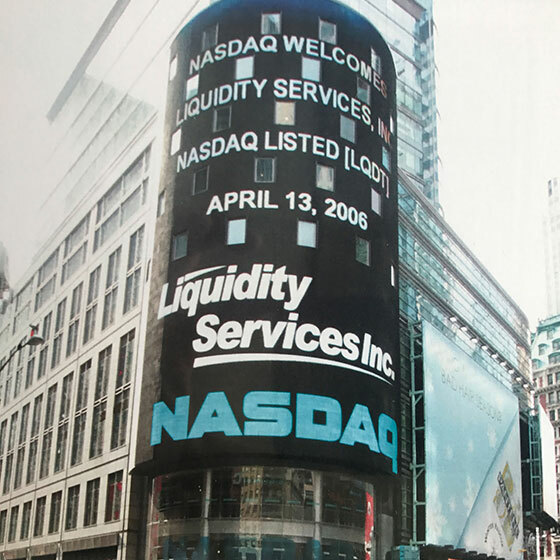 The company’s initial public offering (IPO) took place on February 23, 2006 and the company began trading on the NASDAQ stock exchange under the symbol LQDT. The same year, the company continued expanding its warehouse square footage, opening additional warehouses in Las Vegas, NV, and Plainfield, IN, to serve its retail and product manufacturers selling surplus inventory. As the range of surplus goods flowing through warehouses grew, the company added more means for customers to purchase surplus through Liquidation.com Direct, a direct sales channel for bulk volumes of retail product. From 2008 to 2011, Liquidity Services continued to grow, acquiring new marketplaces: Network International and GovDeals, which expanded the company’s presence in the energy and government verticals. Founded in 1999 as Liquidation.com, Liquidity Services was built upon the idea that technology, efficiency, and client partnerships could revolutionize the fragmented reverse supply chain. For years, liquidators dominated the secondary market with a “buy low; sell high” mentality, creating an adversarial relationship with sellers. Meanwhile, sellers approached their surplus inventory as an afterthought and missed the full potential of their excess inventory. To solve this problem, Liquidity Services built a B2B online platform to empower sellers – initially within the retail industry – to target and reach buyers. This online marketplace, called Liquidation.com, was one of the first professional B2B online auction marketplaces that connected sellers to buyers in a transparent and effective way. The site helped buyers across the world source bulk lots of surplus merchandise from major retailers through competitive online auctions, while sellers successfully maximized value for their overstock inventory and consumer returns. In 2001, Liquidity Services further expanded its services offering through a large contract with the United States Department of Defense and the Defense Logistics Agency (DLA) to sell its usable military surplus property. Following the contract win, Liquidity Services updated its processes, enabling more rapid movement of surplus through its marketplaces to improve recovery on behalf of its sellers in both the retail and government industries. Profitability was achieved in 2002 when the company reached $72 million in annual sales.